The R-PLEX Human BDNF Antibody Set includes a matched capture and detection antibody pair and calibrator for the quick and easy measurement of BDNF in biological samples. R-PLEX products leverage MSD’s electrochemiluminescence technology for better sensitivity and a larger dynamic range than traditional ELISAs. R-PLEX matched antibody sets enable the development of singleplex and multiplex immunoassays. Individual assays may be developed using MSD avidin- or streptavidin-coated plates. Custom multiplex assays with any combination of R-PLEX analytes, as well as R-PLEX plus U-PLEX analytes can be developed on U-PLEX MULTI-SPOT plates. To learn more about the advantages of R-PLEX products click here. 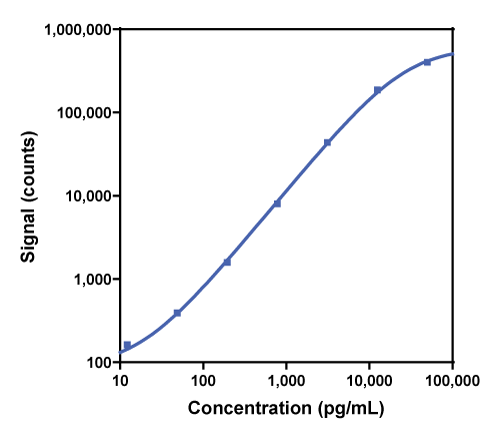 Calibration curve for the R-PLEX Human BDNF Antibody Set was assessed and representative data is presented below. Description - Brain-Derived Neurotrophic Factor (BDNF, ANON2, BULN2) is part of the nerve growth factor family. BDNF promotes the survival and differentiation of selected neuronal populations of the peripheral and central nervous systems. The protein is active in the hippocampus, cortex, and basal forebrain, and is important for long-term memory. BDNF is neuroprotective in neurodegenerative conditions, peripheral nerve injury, and stroke. BDNF has been associated with brain trauma and neurodegenerative conditions. Use of serum biomarkers in a diagnostic test for irritable bowel syndrome.